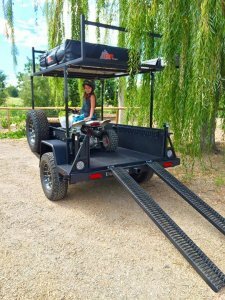 Ever considered an offroad trailer? With the UGOAT, you just might. 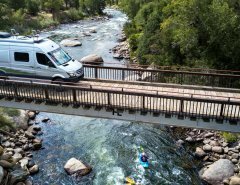 Tow, tie down, ratchet, and haul almost anything, from kayaks to mountain bikes, ATVs, or refrigerators. And, oh yeah, you can camp in it, too. 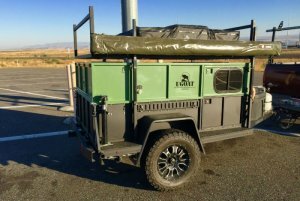 The new brand UGOAT (Utility Go-anywhere Off-road Adventure Trailers) looks like the answer to almost every backcountry problem and necessity you’ll ever encounter. The basic genius behind the UGOAT, as far as we can tell, is its adaptability. Like any good trailer, it’s made with 1/8-inch steel and a host of cargo retention mounts. Unlike most trailers, these are made to be built up, altered, and customized to your needs. 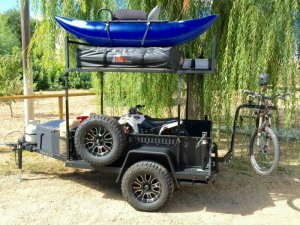 The standard Scout model is burly enough to haul big gear on the bed like an ATV and extra gear up top, two canoes or kayaks, for example. The Scout also has a front tool box, charging ports, and solar panels for juicing up the onboard battery on sunny days. 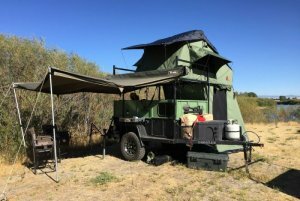 If you really want to get organized and carry everything INCLUDING the kitchen sink, UGOAT has upgradeable “camping tops.” The two aluminum storage boxes round out the base model into a fully equipped glamping system. The upper “galley” box has its own locking door with screened window and dome light. 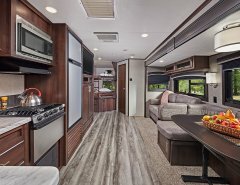 The rear holds a built-in paper towel holder and kitchenette storage. You can stock this yourself, or upgrade with an optional six-person dinnerware set (plates, cups, pans, pots, bowls, and flatware). You can even add a clip-on propane cooking station that snaps to the side of the trailer (single and double propane carriers available). 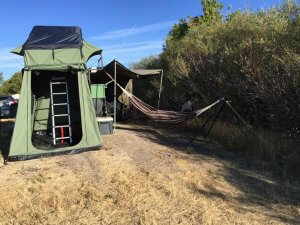 The lower camping box holds a 21-gallon water tank with pump, two water outlets, one for the sink (included), the other for an outboard hot shower (optional). Currently, every UGOAT is made at its Eagle, Idaho, headquarters. The father and son team are taking orders on their site. The base model Scout (no add-ons or camping boxes) runs $11,000. 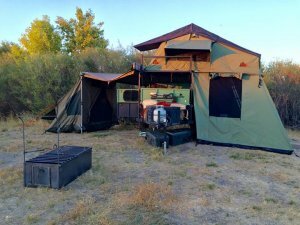 A full camping-box upgrade costs $15,000. And for all the included bells and whistles: shower, propane tanks, dinette set, and more, you can expect to spend over $17,000. 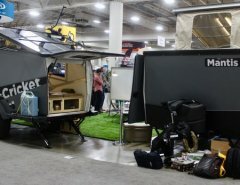 That’s a hefty price, but these trailers are unlike anything we’ve seen. If you need a seriously tricked-out, heavy-duty tow-behind that will turn everyone’s head, this is probably the trailer you’ve been waiting for.